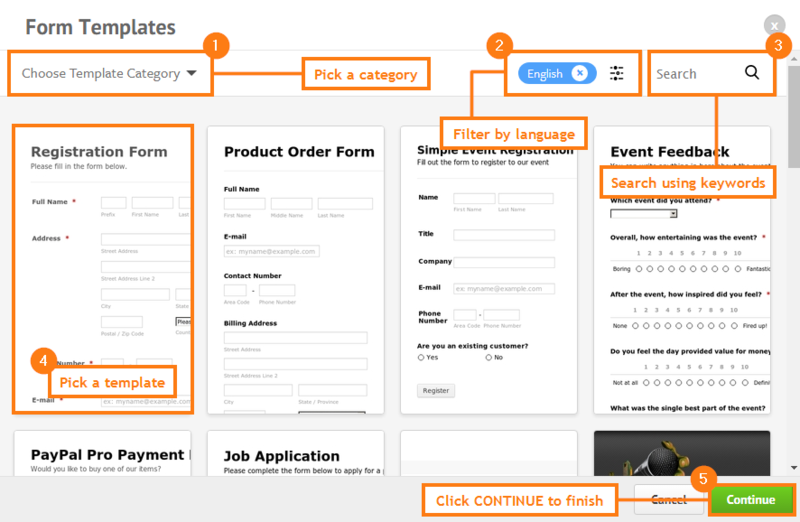 Form Templates are the usual go-to solution of first time JotForm users. Whether you're looking for a template to get started with, a form that closely matches your requirement, or even just using it for the design and layout, templates are the simplest way to achieve all these. With just a few steps, you'll be able to get started with a readily-made form. You can also browse our Templates Gallery and use a template from there. 1. Go to the MY FORMS page and click the CREATE FORM button. 2. On the USE TEMPLATE section, click the SELECT button. 3. Use the options at the top of the Form Templates popup modal to narrow down your search results. You can choose from a variety of Categories, filter results by Language, or use the Search bar. 4. Once you find what you're looking form, click the template. It will show you a preview of how it looks like. 5. If all is good, hit the CONTINUE button and you're done. This entire process will create a new form on your account and you'll be redirected to the Form Builder where you can start modifying the template. How do I change the background color on a template I used? I copied over a registration form, then added three new fields. Everything looks great, but when testing the form, I can't enter text into those three new fields. The other fields work just fine. What am I doing wrong? Hello- I built a form based on a template and the browser tab identifier says "Crowne Plaza Englewood, NJ." How do I change this? Olá, é assim que já fiz uso dos Modelos. Mas, há meses que não consigo mais e sempre que tento fazer, abre uma caixa de mensagem dizendo que não posso clonar. Qualquer forma que tento, acontece isso. Já tratei disso ha uns meses atras, mas o problema persiste. How do I embed the form on my Facebook e-commerce site. Please I did not understand how to use this.please Help me. Nowhere do I find a single word of explanation about what "page conditions" are or how to set them. I am trying to modify the the text in a template so that it doesn't show generic labels (New Product 1, etc) and modify the payment amounts. However, the form is not letting me modify these fields. Help, please. It will not let me modify a template I saved! Why??? Do I have to sign up if I were to create the form? Can you edit form templates? If so how? Excellent..I can't say any other word excellent...excellent. Submit button is not in correct alignment, can you help? Adding text users can Edit in a form?